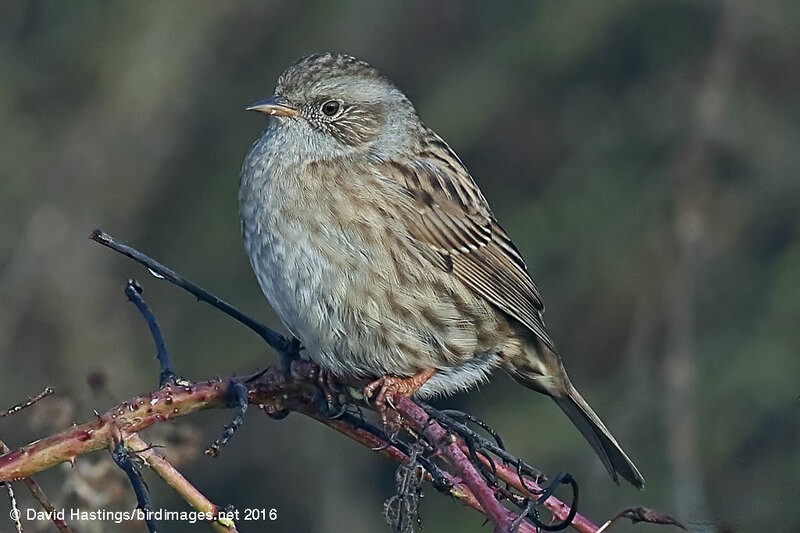 Dunnock (Prunella modularis). Taken at Otmoor, Oxon., on December 28th 2016. Taken at Otmoor, Oxon., on December 28th 2016. The Dunnock (also known as the Hedge Accentor and Hedge Sparrow) is a small brown and grey bird. Quiet and inobtrusive, it is often seen on its own, creeping along the edge of a flower bed or near to a bush, moving with a rather nervous, shuffling gait, flicking its wings as it goes. It can be found throught the British Isles. It breeds in parks, gardens, open woodland, heaths and commons with gorse or scrub, and areas with hedges or thick shrubbery. When two rival males meet, they become animated with lots of wing-flicking and loud calling. It has Amber status on the British list, alough there are around 2.1 million territories.